TwoHawksNYC – Page 38 – Soaring through NYC and beyond to bring you closer to wild things. Landing in 25 mph wind gusts. Hot mess. Format GalleryPosted on March 15, 2015 November 17, 2015 Categories UncategorizedTags birds, birds of prey, east village, hawks, nest, nyc, red-tailed hawk, Red-tailed HawksLeave a comment on Landing in 25 mph wind gusts. Hot mess. Red-tailed hawks starting to build their nest after being evicted from the AC unit they called home last year (a few blocks away). 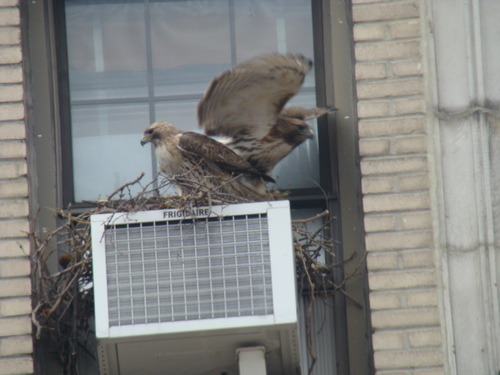 The Red-Tailed Hawks arrive on Ave A! Format GalleryPosted on March 6, 2015 November 17, 2015 Categories UncategorizedTags east village, nyc, red-tailed hawk, Red-tailed HawksLeave a comment on The Red-Tailed Hawks arrive on Ave A!